Dong Zhuo has his troops evacuate the capital Luoyang and burn it to the ground. Septimius Severus adhered to the Roman emperor with the support of the army corps. The Byzantine general Belisarius receives his promised reinforcements, 1,600 cavalry, mostly of Hunnic or Slavic origin and expert bowmen. He starts, despite shortages, raids against the Gothic camps and Vitiges is forced into a stalemate. the Norman chief Bohemond of Tarentum arrives at Constantinople and swears allegiance to his former enemy, the Byzantine emperor Alexis I Comnenus. Battle of Liegnitz: Mongol forces defeat the Polish and German armies. Mongol invasions of Vietnam: Yuan forces are defeated by Trần forces in the Battle of Bach Dang in present-day northern Vietnam. After Henry IV died on 20 March 1413, Henry V succeeded him and was crowned on 9 April 1413 at Westminster Abbey, London, Kingdom of England. The ceremony was marked by a terrible snowstorm, but the common people were undecided as to whether it was a good or bad omen. Henry was described as having been "very tall (6ft 3 in), slim, with dark hair cropped in a ring above the ears, and clean-shaven". His complexion was ruddy, the face lean with a prominent and pointed nose. Depending on his mood, his eyes "flashed from the mildness of a dove's to the brilliance of a lion's"
The Treaty of Lodi is signed, establishing a balance of power among northern Italian city-states for almost 50 years. Signature, grâce à une médiation du roi de France Henri IV, de la trêve de douze ans entre l'Espagne et les Provinces-Unies (Hollande), qui aboutit à une reconnaissance de fait de l'indépendance de celles-ci. Eighty Years' War: Spain and the Dutch Republic sign the Treaty of Antwerp to initiate twelve years of truce. American War of Independence: Battle of the Saintes begins. Указ Петра I «О наблюдении чистоты в Москве и о наказании за выбрасывание сору и всякого помету на улицы и переулки». Decree of Peter I "On the observation of cleanliness in Moscow and the punishment for throwing rubbish and any droppings on the streets and lanes." English chemist Humphry Davy discovered the anesthetic properties of a laughing gas. On his phonautograph machine, Édouard-Léon Scott de Martinville makes the oldest known recording of an audible human voice. Louis Pasteur, présenté à la Sorbonne sa découverte que de nombreuses maladies peuvent être causées par des micro-organismes. Sa méthode de chauffage à court terme tue les germes. American Civil War: Robert E. Lee surrenders the Army of Northern Virginia (26765 troops) to Ulysses S. Grant at Appomattox Courthouse, Virginia, effectively ending the war. Samuel Percy receives an American patent for a process for the production of milk powder. Completion of the first Lake Biwa Canal. Charles Stewart Rolls sets the first speed record for petrol cars with a Mors in Achères near Paris at 101.547 km/h. The U.S. Congress passes the Payne–Aldrich Tariff Act. Mexican Revolution: One of the world's first naval/air skirmishes takes place off the coast of western Mexico. German forces launch their third offensive of the battle. The battle begins with Canadian Corps executing a massive assault on Vimy Ridge. The Portuguese Expeditionary Corps is crushed by the German forces during what is called the Spring Offensive on the Belgian region of Flanders. The Kamikaze arrives at Croydon Airport in London. It is the first Japanese-built aircraft to fly to Europe. Germany invades Denmark and Norway. The Battle of Bataan/Bataan Death March: United States forces surrender on the Bataan Peninsula. The Japanese Navy launches an air raid on Trincomalee in Ceylon (Sri Lanka); Royal Navy aircraft carrier HMS Hermes and Royal Australian Navy Destroyer HMAS Vampire are sunk off the island's east coast. The United States Atomic Energy Commission is formed. The United Nations Security Council Resolution 22 is adopted. Jorge Eliécer Gaitán's assassination provokes a violent riot in Bogotá (the Bogotazo), and a further ten years of violence in Colombia. Fighters from the Irgun and Lehi Zionist paramilitary groups attacked Deir Yassin near Jerusalem, killing over 100. The Suez Canal in Egypt is cleared and opens to shipping. NASA announces the selection of the United States' first seven astronauts, whom the news media quickly dub the "Mercury Seven". First indoor baseball game is played. The first British-built Concorde 002 makes its maiden flight from Filton to RAF Fairford. The U.S. Navy nuclear submarine USS George Washington accidentally collides with the Nissho Maru, a Japanese cargo ship, sinking it. The April 9 tragedy in Tbilisi, Georgian Soviet Socialist Republic, an anti-Soviet peaceful demonstration and hunger strikes, demanding restoration of Georgian independence is dispersed by the Soviet Army, resulting in 20 deaths and hundreds of injuries. 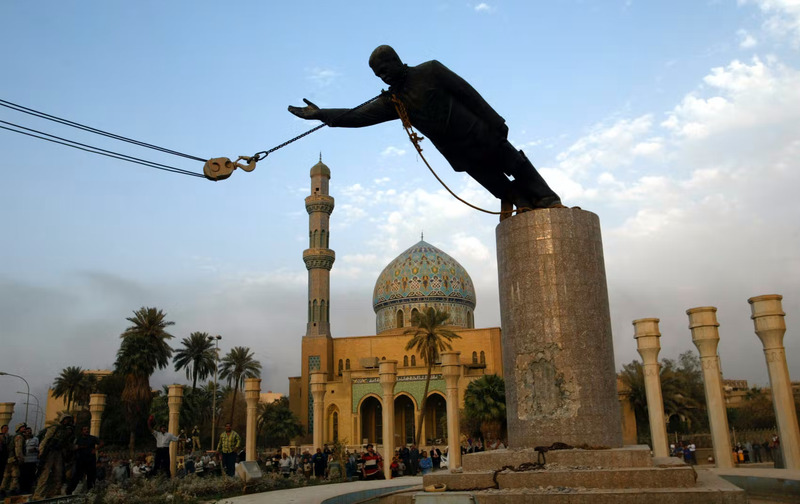 Iraq War: Baghdad falls to American forces; Iraqis turn on symbols of their former leader Saddam Hussein, pulling down a grand statue of him and tearing it to pieces.